DUMBARTON played their first match in the Ladbrokes League One and gained a comfortable win over East Fife at New Bayview. DUMBARTON played their first match in the Ladbrokes League One and gained a comfortable win over East Fife in front of a 525 crowd at New Bayview. They claimed full points from their league season opener in Methil with a brace of second half goals. 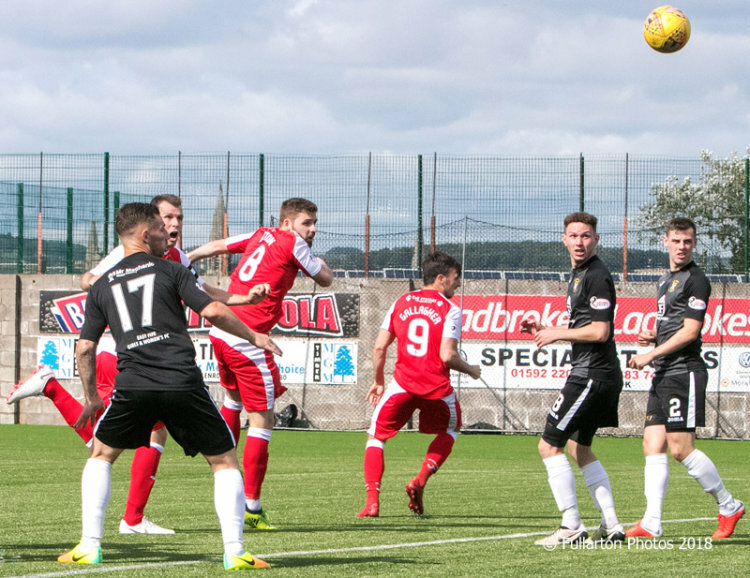 Most of the momentum in the early stages of the match came from the Fifers men, with Sons struggling to maintain possession. East Fife spurned several chances before the visitors started to get into the game and created several decent opportunities themselves. Neither side could break the deadlock in the first 45 minutes, but straight after the break Sons went in front. On 47 minutes Andy Dowie headed home for 1-0 after a good cross from Ross Forbes (pictured). Then on 61 minutes it was another corner for Dumbarton and another goal — this time from Callum Gallagher. Sons were defending deep in their own box on 76 minutes when a superb ball from Forbes suddenly put Michael Paton through on goal. But his fierce shot crashed back off the post. East Fife pressed for the remainder of the game, but Dumbarton defended solidly to see out the 2-0 win.